Update your living room with this luxurious modern sectional sofa. Plush tufted cushions have a contemporary style, while offering supreme comfort. Flared arms and a sleek wooden base rail complete this rich contemporary style. Durable and American made, this sectional will be a long lasting favorite in your home. The 1260 L-Shaped Contemporary Sectional Sofa with Flared Arms and Tufted Cushions by McCreary Modern at AHFA in the area. Product availability may vary. Contact us for the most current availability on this product. 1260-DLL LAF Daybed 1 39" 90" 33"
1260-PRL RAF Apartment Sofa 1 70" 41" 33"
Leg or Skirt Wooden base rail and tapered exposed wood block feet. 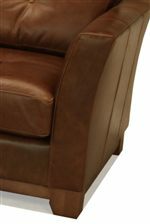 The 1260 collection includes high quality American made upholstery items that are built to last. These pieces feature clean modern lines that will update your home, with flared arms, tufted cushions, and sleek wooden base rails. Sophisticated, yet casual and comfortable enough for everyday use, these upholstered items will fit nicely into your home. The 1260 collection is a great option if you are looking for Contemporary furniture in the area.